Keep your favorite toys clean and safe with this antibacterial cleaner (4 fl oz). Our unique cleansing agent gently cleans and disinfects surface bacteria, yet it's mild enough to use every time. 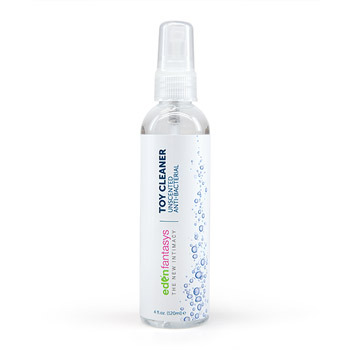 Generously sized, this cleaner lasts for many uses. Directions: Remove the batteries from the toy, if applicable. Pump desired amount of toy cleaner onto clean cloth and wipe the toy's surface. Gently rinse the toy in room temperature water being careful not to get the battery compartment wet. To extend the life of the toy, clean regularly and remove the batteries when not in use. See manufacturer's recommendations for cleaning of cyber materials. Warning: If irritation or discomfort occurs, discontinue use and consult a doctor. Keep out of reach of children. Thank you for viewing EdenFantasys toy cleaner page!